Indiana University East recognized several faculty during the Honors Convocation ceremony held April 20. Presented during the ceremony were the Trustee IU East Faculty Recognition awards. Josh Tolbert, assistant professor of special education, received the Progress Award for New Faculty. This award is given to faculty to acknowledge their contributions to teaching, research and service. 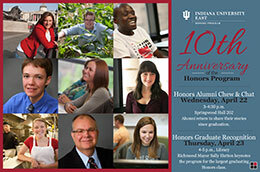 This spring, the Indiana University East Honors Program is celebrating its 10th anniversary. The first Honors introductory course, H100, was taught in spring 2005 with 15 students. The Honors Program is an academic program that provides an intellectually enriched curriculum for highly motivated students, allowing them to demonstrate academic excellence through Honors coursework, independent research, creative work, and extracurricular opportunities. Members of the Honors Program are on-campus undergraduate students from all different majors and degrees. In addition to taking Honors options in five of their courses, they complete a senior thesis of research, service-learning, or creative work.